Today, as in the 1970s, the central courtyard is an oasis within the city. Along with a pool, the area is also home to a market-centric restaurant. The street-facing mirrored-glass facade is likely a remnant of a 1980s renovation—an attempt to modernize the building as the colonia deteriorated around it. The architects decided to keep what they considered a challenging design element to showcase the concept of the building, much like the neighborhood around it, slowly revealing its beauty layer by layer. A pool is still the focal point of the courtyard, but its modernized, streamlined design makes a dramatic statement. Little remains of the former hotel except for the motel-style exterior corridors, which combine a concrete-brick lattice and plywood details. Each room was designed by a group of young interior designers and features details like custom wood installations, concrete furniture, rugs by Lagos del Mundo, and works by contemporary artists curated by Arróniz Galería. The black stairs lead up to a private roof deck perfect for sunbathing and enjoying views of the city rising around the hotel. The roof decks, restaurant, and public spaces all feature furnitute designed by La Metropolitana, a design collective that produces their furniture in a workshop in nearby Obrera. These pieces combine CNC-cut wood with cord woven using a Danish technique the designers learn by watching YouTube videos. Founded in 2008, the group is working to develop small infrastructures in different cities, each operating independently with local materials, local workers, and local suppliers. The La Metropolitana team is also behind Taxonomía, a boutique and exhibition space on the first floor of the hotel. The store highlights a variety of Mexican designers working in everything from furniture and tabletop accessories to fashion design. Its multifaceted mission: support the local creative economy and discourage talent drain to other countries, all while providing a platform for the country's cutting-edge talent in an effort to encourage further growth. Photo by Rafael Gamo. Image courtesy of JSa Arquitectura. 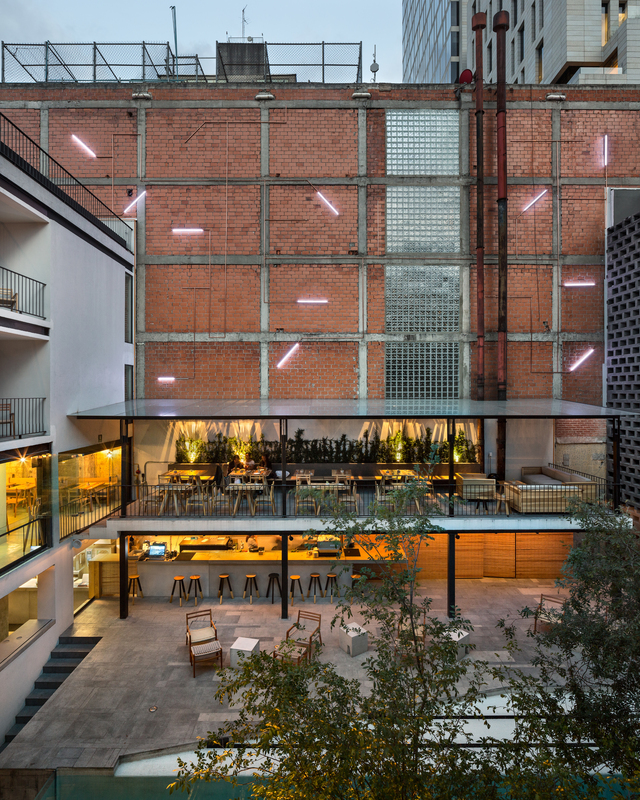 In Mexico City's central Cuauhtémoc neighborhood, the new Hotel Carlota revives a once-glamorous location. The 36-room hotel takes the place of Hotel Jardín Amazonas, a popular 1970s hangout that had fallen out of favor and lingered on into the 21st century as a run-down budget motel. For architect Javier Sanchez of JSa Arquitectura, the transformation from motel to (boutique) hotel began with "urban-archeological work," as his team researched the structure's past lives. Digging through decades' worth of renovations, and, virtually, through Google Images, they found inspiration in the relaxed poolside glamour of the interior courtyard in its heyday—then updated it by losing dated touches like the AstroTurf patio and by streamlining the swimming pool into a modern, glass-edged refuge. To complete the project, JSa called in an army of young interior designers and emerging artists, who transformed each room into a singular place to stay in the capital city—one that combines chic accommodations with a total immersion in a city's booming design scene.